Humphries, G.R.W., Flemming, S.A., Hammer, S., Hirata, K., Kappes, M.A., Kappes, P., Magnusdottir, E., Major, H., Mcduie, F., McOmber, K., Orben, R.A., Schmid, M.S., Wille, M.
Despite their long-standing and central role in the dissemination, promotion and defense of science, scientific societies currently face a unique combination of economic, social and technological changes. 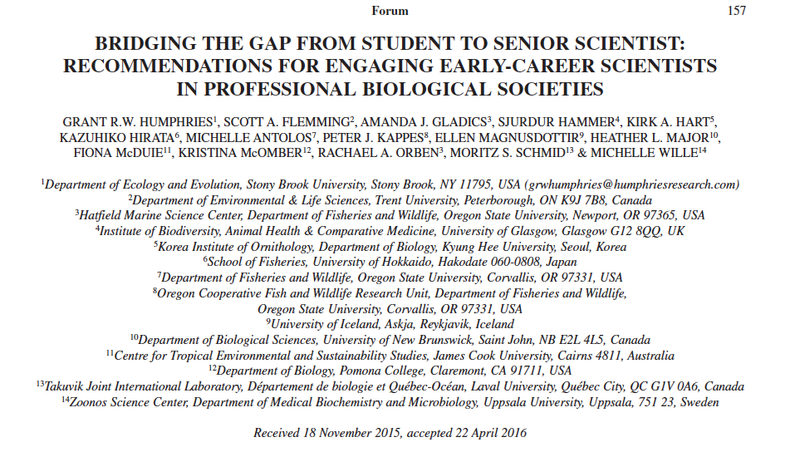 As a result, one of the most pressing challenges facing many societies is declining membership due to reduced recruitment and a failure to retain members, particularly early-career scientists (ECSs). To ensure that professional biological societies retain long-term viability and relevance, the recruitment and retention of ECSs needs to be a main priority. Here we propose a series of recommendations that we, a group of ECSs, believe will help professional societies better integrate and retain ECSs. We discuss each recommendation and detail its implementation using examples from our personal experiences in the global seabird research and management communities and from our collective experience as members of several professional societies. We believe these recommendations will not only help recruit and retain ECSs as society members, but will also directly benefit the organizations themselves.